As optimistic as Steven Universe can be about the possibilities of open communication and honesty, the show still acknowledges that sometimes conflict is inevitable. Everyone has desires, insecurities, and personality traits that come into conflict every so often, kicking off something like the “Cry For Help” arc. In these cases, Steven Universe usually takes pains to give the fighting parties a bit of space—the argument will inevitable be resolved at some point, but that doesn’t mean the characters still don’t have time to be in their feelings. Besides Connie’s continued refusal (or inability) to respond to Steven’s plaintive texts, “Raising The Barn” introduces a new conflict that will likely take a while to resolve, because it ends with one of the parties in space. When Steven tells Peridot and Lapis what happened on Home World, Lapis’ immediate instinct is to run from the vengeance the Diamonds are going to bring upon the Earth, and she doesn’t waver from that, even in the face of teamwork and kindness and all the other positive emotions the Crystal Gems are bringing to the table. The conclusion of this episode makes sense emotionally. Lapis has gone a long way toward being socialized on Earth, and become comfortable enough in her life with Peridot, but she still has a deep-seated fear of another Gem War. (To be fair to Lapis, the last Gem War left her trapped in a mirror for thousands of years, so I can’t blame her.) Still, storyboard artists and writers Amber Cragg and Hilary Florida do a great job of letting Lapis abandoning ship come as something of a surprise, since for most of the episode it seems like if Peridot is just honest about her desire to stay on Earth, Lapis will follow suit. Or, as Peridot puts it, “You’re supposed to reward me for my emotional honesty!” Unfortunately, that’s often how TV narrative structure works, but it’s not quite the same for genuine interpersonal conflict. Sometimes you’re honest and open, and still get left in a ditch. Shelby Rabara’s performance goes a long way toward justifying the delay in Peridot’s confrontation with Lapis. Each time Peridot talks about the prospect of simply going into space with Lapis, Rabara adds a slight quiver to her voice that implies her anxiety without going overboard into telegraphing it—especially when she realizes that “we’ll never know” if anything goes wrong on Earth, since there’s no WiFi signal for her tablet out in space. And when Peridot grabs onto Pumpkin’s tail and starts yelling about how sometimes we have to do things we don’t want to do, it rings true for any situation where a partner or family member effectively puts us into a difficult or unpleasant spot. Peridot has made a lot of sacrifices for Lapis (which Lapis calls “lying,” though whether that’s true is a debate for another day), literally bending over backwards to make sure that her partner is comfortable. Sometimes, that’s not actually the healthiest thing for the relationship, or for the other person. Under the weight of all this distress, “Raising The Barn” is still thankfully a funny episode, including a quick Onion gag and Peridot’s frantic realization that if they leave the barn with all their meep morps, the installations will lose their context and become... performance pieces. (Cue Steven: “It’s okay. Performance isn’t bad, just misunderstood.”) Some of these moments lose their humor or move a little quickly, especially when Lapis pushes aside Peridot’s initial attempt to assuage her by saying that Steven is important (in contrast to Peridot). And some of them are more poignant in retrospect—like when Steven plucks at his ukulele, preparing to sing a song about how he needs to let Connie go for now—only to be interrupted by the phone ringing. 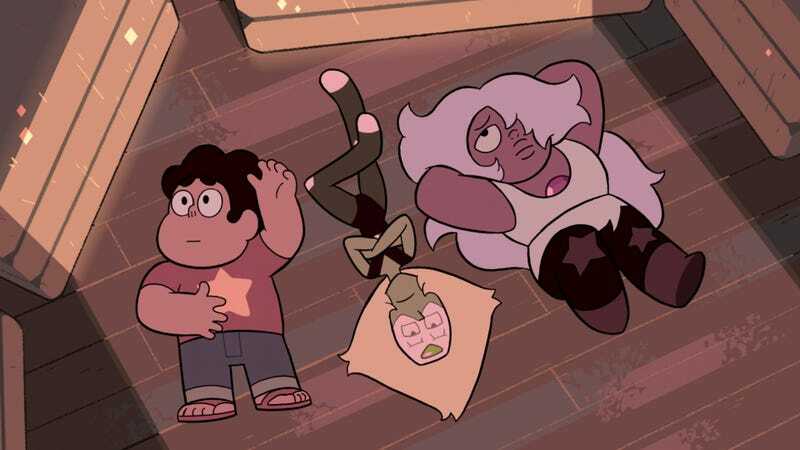 Now, he and Peridot are both in the same position. "Raising The Barn"/"Back To The Kindergarten"
I’ve made no secret of how much I love Peridot—she’s a huge nerd, overwhelmed by the beauty of the Earth and totally incapable of grasping the nuances of emotional subtext, even as she tries to become a considerate friend and partner. The years of character development Rebecca Sugar and the rest of the Steven Universe team pay off in a huge way here, as Peridot gets her own, phenomenal breakup episode. I imagine the biggest criticism someone might have of “Back To The Kindergarten” is that it’s too on the nose—Amethyst does literally drag Peridot out of the bathroom and force her to get to work on other projects, replanting the Kindergarten as a way of distracting her from Lapis leaving. Yes, Peridot’s despair when the Kindergarten proves to be totally barren is very much a monologue about what it’s like to have the first glimmers of hope after a breakup and then watch them get snuffed out. But, as anyone who’s been through a breakup this serious will tell you, does it ever go any other way? Steven and Amethyst add some emotional cushioning and humor to the episode by being good friends. Amethyst knows Peridot pretty well, suggesting that “You can make us feel dumb by telling us all the stuff we don’t know” in a trip back to the Kindergarten to look at the holes of the other Amethysts our Amethyst met back at the zoo. (This is a very funny and good Michaela Dietz line delivery.) Peridot acquiesces: “I miss that.” And Steven mostly ignores his own ongoing anxiety over Connie—there are some indications that it’s still in the back of his mind, but mostly that comes through in him being a bit quieter, but still transmitting his enthusiasm over the idea of replanting the Kindergarten and turning it into a place where life can grow. Still, this is Shelby Rabara’s episode. Rabara does near series-best work here, imbuing all of Peridot’s cold, calculating nature and her newfound emotional attachments into lines like, “My sector of countryside was perfect. Now it’s somewhere in space.” Even in an episode where we get a brief glimpse of Smoky Quartz (as Amethyst and Steven fuse to take out the mutant hiding under the Kindergarten posing as the flower), Peridot owns every scene, appearing as a black hole of emotion and then, slowly, a rebuilding person remembering all of the things that made her happy. Peridot has been through a lot over the course of the series—Steven might be working through his issues with Connie, but at least he didn’t explicitly foreswear his entire life while cursing out his superior. Peridot’s explanation of the subtext of the episode is fantastic, with Rabara’s vocal performance remaining grounded enough to allow Mitroff and Villeco to get away with essentially giving her a soapbox. As much as Peridot could be “any other place,” she can’t escape Lapis, consumed by an obsession with the end of their relationship rather than any of the other infinite things she could be doing. Still, there’s light at the end of the tunnel, exemplified by the montage of Peridot, Steven, and Amethyst just doing stuff while they attempt to rebuild the Kindergarten. This is just one of any number of activities she could be doing, like lecturing Steven and Amethyst, working with robots, or reviewing episodes of her favorite TV show. It’s a calm, quiet moment in the middle of a depressing story, and it’s one of my favorite things I’ve seen from Steven Universe in a while.